The DeLuxe Stitch Master is quiet, fast, dependable and inexpensive; ideally suited for small print shops. This sturdy machine has a convenient one-knob adjustment for work thickness and leg adjustment which sets it apart from its competition. This machine’s convertible table top supports both flat and saddle stitching, while providing solutions for varied stitching needs. The DeLuxe Stich Master has a sheet capacity of up to 1/4 inches and comes complete with side stops, a contact trip, and foot switches. The Stitch Master is designed to be clamped to any work table or to a floor stand, which are available separately. All wire machines come standard with a new stronger magnetic swivel. Two Stitch Masters can be connected to form an effective two-headed stitching machine. Double-headed models come complete with two SM-A25 Stitch Masters and SMK-4 table adaptor. 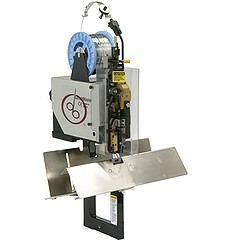 If you have any questions or are interested in purchasing the DeLuxe Stich Master, visit us at SpiralBinding.com. We have great pricing on a full line of Saddle Stichers. Call us at 1-800-631-3572 for more information!